This species is native to the Canary Islands (Spain), but El Hierro, where it grows on the rocks in arid and sunny zones up to about 600 m of altitude. It thrives and blooms from autumn to spring, going almost to rest in summer, with partial loss of the leaves. The genus is honoured to the brothers Lavatier, Swiss physicians and naturalists who lived in the XVII century; the name of the species is the combination of the name of the genus Acer and of the Latin word “folium” = leaf, with obvious reference. Common names: Canary tree mallow (English); lavatère à feuilles d’érable (French); malva de risco, malvarrisco rosada (Spanish); Rosa Ahornblättrige Kanarische Strauchmalve (German). The Lavatera acerifolia Cav. (1803) is a perennial, 1-2,5 m tall, shrub with greyish bark. It has alternate leaves, on a 4-9 cm long petiole, palmate, of pale green colour, 5-8 cm long and divided, until the mid, in 5-7 lobes with sharp apex and irregularly dentate margins, of which the lateral two are much smaller. 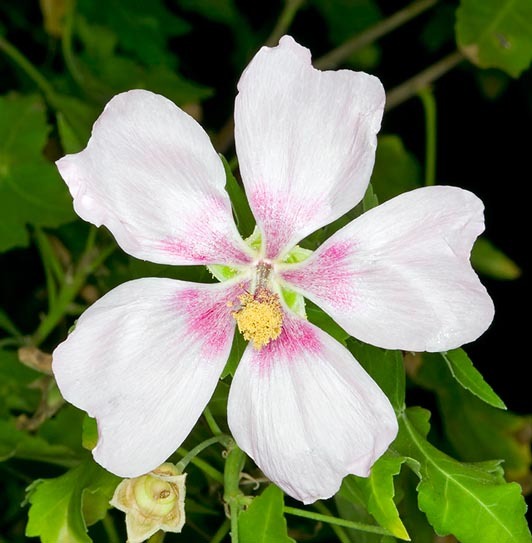 The flowers, of 3-6 cm of diameter, are solitary or in small axillar groups or terminal, and have epicalyx (involucre of bracts similar to sepals placed under the calyx, typical of the Malvaceae), with three ovate, tomentose, lobes, campanulated with a five sharp lobes margin calyx and five white or pink mauve petals with a purple dot at the base, open, united at the base of the purple staminal column. The fruits are capsules subdivided into 12-15 loculi, each one containing one seed only. It reproduces in spring by seed, which germinates in 2-3 weeks at the temperature of 18-20° C, by cutting, in sandy soil and by air layering. Rather little cultivated species, it needs full sun and well drained soil; it is suitable for warm temperate climates where it can bear some degrees below the 0° C, possibly losing the aerial part, which will grow again from the base in spring. Waterings must be regular in summer, and practically stopped in winter. It has a limited utilization as pot plant, in sandy mould rich of organic substance, to be placed in the most possible luminous location at a temperature not below the 10° C in winter. Synonyms: Saviniona acerifolia (Cav.) Webb & Berthel. (1836).